I love getting my hair cut, but as I have long hair I find it quite a challenge to really priorities getting myself booked in sometimes. Yes, I know it ends up looking all straggle and damaged, but at the end of the day I can tie it up or something and it’s not that bad. If I had shorter hair, with more of a defined style I know a hair cut would become far more urgent when needed – but for me, it’s always something where I say ‘I need to get my hair cut’ but it’s always on the ‘tomorrow’ section of my to-do list. 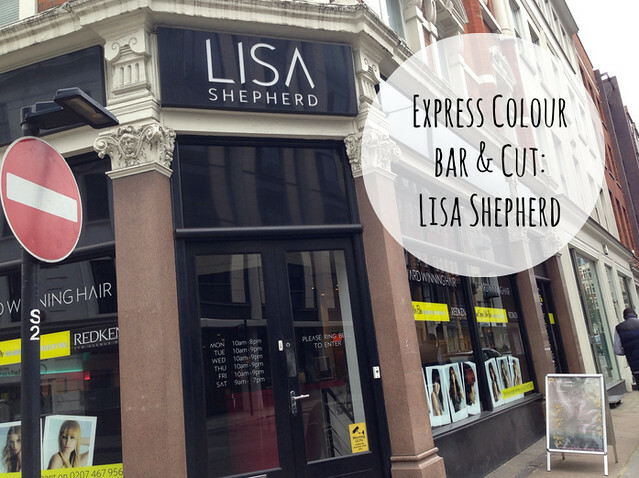 But that changed when I had the chance to visit the Lisa Shepherd salon, which is very conveniently located to my work and also close to Oxford Circus so weekday or weekend, it was an easy, convenient trip (important for me, I like things to be convenient as much as possible). So I went along to have a much needed hair cut and also give their new Colour Bar a trial run. The Colour Bar is a new ‘speed’ service, for some routine or touch up type of colour treatments – with options like a gloss treatment, a root touch up, an all over colour or a smattering of highlights (six, to give a bit of a boost between the full or half head sessions). I chose to go for the latter and get a little highlights touch up to brighten things up a little around the front of my hair. The promise with the service is that you’re in and out within an hour – with convenience at the heart of it, so you could fit it in within your lunchbreak or a quick afterwork appointment before heading out for the night. I can’t really comment on the speed part because my appointment took much longer than an hour – but I was having my hair cut too. The Colour Bar is literally a bar style area at the front of the salon, where you sit on a high stool, have a quick consultation then have your colour treatment done. The idea then being that your hair is washed or whatever and then you go to the blow-dry bar to dry your hair yourself. The whole salon is really geared towards self-service, with self-service drinks, the colour bar and the blow dry area. All of which you do yourself, this is great for those who want the really technical bits done by the professionals but perhaps like to dry their hair just-so, and prefer to do this themselves. It doesn’t however really lean towards the pampering experience that many other salons go down, it’s all about speed, cost and efficiency. There was one thing that did throw me off a bit when I was in the salon was trialling some ‘eco friendly’ towels – but apparently they weren’t working very well. When my hair was washed I didn’t have a towel put around my neck – so when water started dripping I asked for one and was given paper towels instead?! This was then replaced with what I’m pretty sure was a t-shirt (I could see the sleeve…) so I did ask my stylist and it was explained that the towels they were trialling weren’t working very well so they weren’t sure if they were going to continue. Totally fair enough, and commend them on the eco-friendly approach, but it was a bit of a strange situation to be given paper towels and then a t-shirt…. I’m sure they have the situation sorted now and are back to using proper towels?! As you can *hopefully* see – it was quite a lot of length that I decided to have off. I did love having really long hair, but with such fin hair it just tends to get a bit ‘blah’ and lifeless after a while and even the best products don’t really help all that much. So I decided that since I do want long hair for my wedding next year (possibly considering extensions) that I’d go for the chop now, and be very good at taking care of my hair – no more many-months between cuts, weekly deep conditioning, no harsh shampoo and conditioners and avoiding too many heat styling sessions and returning to washing every other day instead of daily. 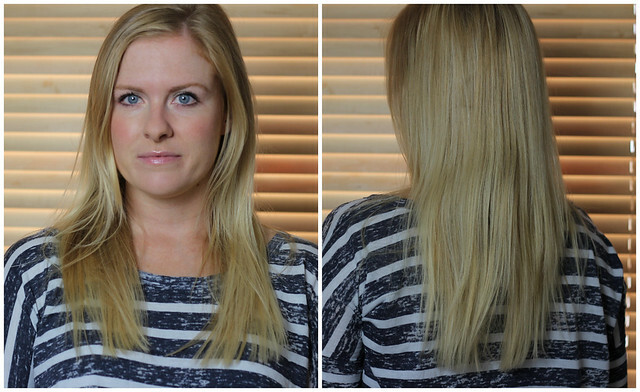 I really like the after, having had about four inches taken off – it felt like a bit of a shock at first but I like it. I also like how the few highlights around the front really brightened things up a bit and took away the brassiness that my hair had a bit of before. 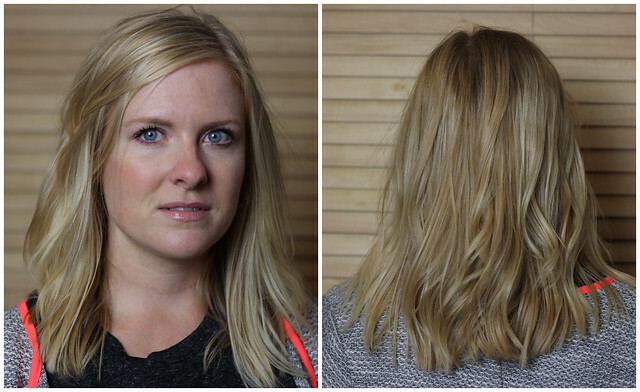 I really like how my stylist finished it with a bit of a wave put in using GHDs, I have tried a few times to replicate this and can give it texture just fine but can’t quite master the same look – I can do one side, but the other doesn’t quite work. But I am determined to master it and maybe then do a tutorial. I do need to get back on the You Tube bandwagon really so that might be a good incentive for me to do so! Overall, I’m really pleased with my new hair cut – I am determined to really look after it over the next year and not play about with things to much at the risk of ending up with cartoon yellow hair or it half falling out because I’ve been too harsh with the heated tools. But I do want to ask one last question – when it comes to hair salons, what’s your preference – convenience, speed and cost or a pampering experience? Personally, I think there’s a time and a place for both but I’d be interested to hear what others think. 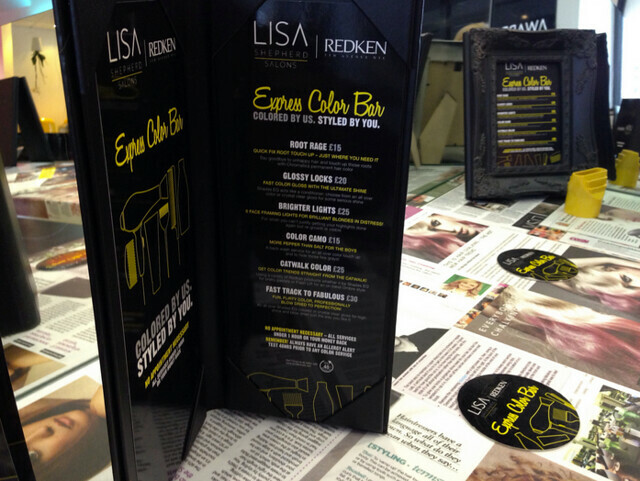 I was a guest of Lisa Shepherd salon for my appointment. Haha – love the bit about the paper towels and t-shirt! How weird. However, your hair looks lovely now, so definitely worth it. I’m exactly the same – always seem to be too busy to get my hair cut. I manage it about 2-3 times a year, which I know is just awful. This idea of self service – getting in and out sounds good too. I’m quite happy to blow dry my own hair, so if it saves time (and some ££? ), then I’m in! They just need to open one down in Southampton! Haha I love reading your reviews.. they are so well written! That sounds like a very odd salon experience! I like the middle ground when it comes to pampering, speed, cost and convenience. I’m willing to pay a little bit more for an experience that is more luxurious/convenient/rapid. However, I like to have my hair blown out and styled before I leave the salon — that is a major part of the experience for me. I have quite thick hair, so I tend to spend a solid 3 hours whenever I go in for all over highlights, and when I spend that much time in a salon I tend to prefer a bit of pampering! wow a hair bar sounds like a brilliant idea. I am however not a fan of having to dry your own hair, that’s a bit odd to me. I love how they have menus and different bars for different hair needs, very cool. I like how your hair turned out, love the color it’s totally brightened up.